Hurricane Maria, a major hurricane, will lash the Turks and Caicos and southeastern Bahamas with heavy rain, strong winds and storm surge as major flooding continues in Puerto Rico. Conditions will improve over the Dominican Republic on Friday as Maria pulls away. Maria is likely to bring high surf and dangerous rip currents to the U.S. East Coast into next week. The center of Maria should remain well to the east of the Southeast coast through the next five days. Hurricane Maria is currently located about 30 miles north-northeast of Grand Turk Island and is moving northwest at about 7 mph. 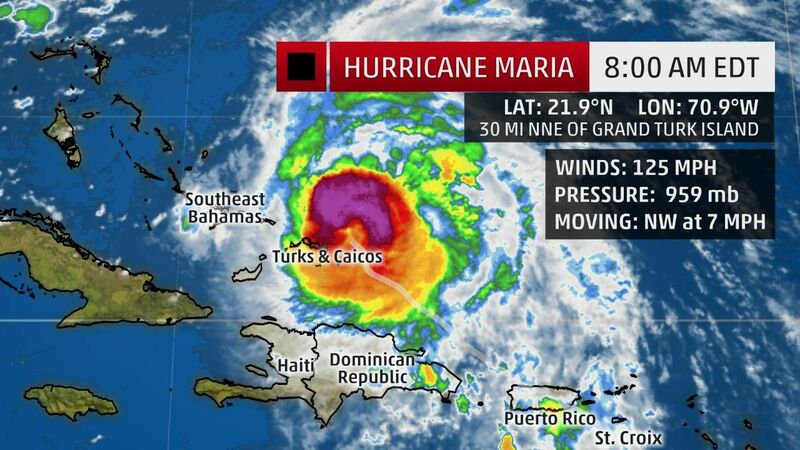 Maria continues to pound the Dominican Republic with heavy rain and strong winds. Wind gusts over 60 mph have been clocked along the northeast Dominican Republic coast, including in the resort city of Punta Cana. Rainbands continue to soak parts of Puerto Rico even as the center of the hurricane moves away. The National Weather Service says that major flooding was ongoing in Puerto Rico on the Rio Grande de Loiza, Rio Grande de Manati and La Plata basins. At least one rain gauge near Caguas, Puerto Rico, has reported more than 30 inches of rain from Maria. Hurricane conditions will continue to spread into the Turks and Caicos and far southeast Bahamas as Maria approaches. Hurricane warnings have been issued for the Turks and Caicos Islands and the southeastern Bahamas. This means hurricane conditions are expected within 36 hours. Hurricane warnings remain in effect for the Dominican Republic from Cabo Engano to Puerto Plata. Maria's core will continue to pull away from Puerto Rico, but bands of locally heavy rainfall will still be possible there through Friday as tropical moisture streams northward on the southeast side of Maria. Portions of the Dominican Republic, especially near the northeastern coast, should see heavy rain and strong winds continue into Friday morning. Tropical storm-force or hurricane-force winds can be expected in the northern Dominican Republic. In the southeastern Bahamas and the Turks and Caicos Islands, hurricane conditions are expected to arrive Friday morning. Maria is expected to slowly weaken over the next 48 hours and then will begin to weaken faster as it reached colder waters. Water levels up to 9 to 12 feet above normal tide levels are expected in the hurricane warning area of the southeastern Bahamas and the Turks and Caicos Islands. Puerto Rico may see an additional 3 to 6 inches of rain, with maximum storm totals up to 40 inches in some areas, through Saturday. The Turks and Caicos are forecast to pick up 8 to 16 inches of rain, with isolated 20-inch amounts. The southeastern Bahamas can expect 4 to 8 inches of rainfall through Saturday. An additional 4 to 8 inches of rainfall is expected in the eastern Dominican Republic with isolated storm totals of up to 20 inches. Western Dominican Republic and northern Haiti may see an additional 3 to 6 inches of rainfall. These rainfall totals have the potential to produce widespread and life-threatening flooding. There is one guaranteed impact that the U.S. East Coast will see no matter what path Maria takes through next week: high surf and dangerous rip currents. The Southeast coast will see the building surf and rip currents starting later Friday. Those heading to the beaches should avoid entering the waters, and boaters should be aware of rough surf conditions. Maria's high surf and rip current danger will then spread north along the rest of the U.S. East Coast through next week. The latest forecast path from the National Hurricane Center (NHC) for Maria shows the center of the hurricane should remain off the Southeast coast during the next five days. That said, Maria still needs to be monitored closely for any possible forecast track changes that could result in additional impacts on the U.S. East Coast next week due to the complicated steering environment for the hurricane. This complicated upper-level weather pattern includes a weakening Jose, a building upper-level high-pressure system, then an arriving southward plunge of the jet stream into the East. The forecast for a more north than northwest motion this weekend is due to a weakness in the steering flow over the western Atlantic that a stalled Jose has a hand in creating. Jose will temporarily block an area of high pressure over the eastern U.S. from moving farther east. If that high had been able to build east faster, it would have sent Maria on a more west-northwest path toward the U.S. Instead, Maria will gain latitude in between that eastern U.S. high-pressure system and another area of high pressure located to Maria's east in the Atlantic Ocean. Jose's low-pressure center will continue to weaken into early next week, which will allow an area of high pressure to rebuild to the north and east of Maria. At the same time, a southward dip in the jet stream over the Lower 48 will slowly approach from the west. Maria will likely take the alleyway in between those two large-scale weather systems. Where that so-called alleyway sets up will determine how close the center of Maria will be in relation to the East Coast as it accelerates north and then northeast next week. At the moment, the latest forecast guidance suggests the center of Maria will stay off the East Coast of the U.S., but it's too early to be 100 percent certain. There is also the chance that the area of high pressure over southeastern Canada may nudge Maria slightly to the northwest, which could allow minor impacts to be experienced along the Outer Banks of North Carolina midweek. Check back for updates in the days ahead as forecast guidance comes into better agreement on the overall long-term steering for Maria.